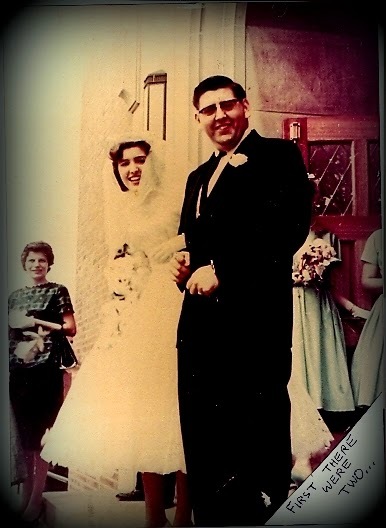 TODAY IT'S FIFTY-FOUR YEARS OF MARRIAGE! 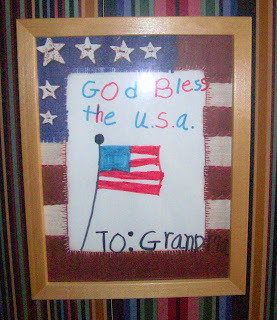 This drawing was given to me a few days after 9-11 by a very young granddaughter as "a patriotic drawing in a sad time." I was impressed that a girl her age was so aware of what had happened and what it meant to us. The drawing still hangs in my home. In 2001, on the morning of the 11th day of September, it was all blue skies and mellow sunshine. So beautiful was the morning that Bob and I hadn't bothered to get dressed. Instead, after celebrating our wedding anniversary the day before, we lingered long and lazy over coffee, enjoying national news with Diane Sawyer. The program ended, then we realized it HADN'T ended. We were seeing a live shot of a passenger jet impaled in one of the Twin Towers of the World Trade Center in New York City. We watched in horror as a second plane hit the second tower; America was under attack! At some point as we watched TV at home, we were startled by the too-loud, too low, too-close sound of a large airliner over our valley; we could feel the rumble! As the sound faded into the distance, we put it out of our minds. In later weeks and months, as details emerged about another hijacked plane that had flown into our northern Ohio skies, we became convinced the plane we'd heard was Flight 93, heading toward D.C.with the heroic passengers who had heard of the attacks through cell phone calls and decided they would re-claim the plane or bring it down! In saving other lives, they lost their own when the plane crashed at Shanksville, PA.
For a period of time after the attacks, there would be no passenger planes in our skies. Before their absence we could not have realized how much we'd miss them. The first time I would see a commercial jet overhead again was at a rural festival. An old man whipped off his hat and waved it skyward, shouting, "Look!" We crowds of people stood together, smiling upward as we watched that shiny plane traverse the sky. When and why and how had that simple every-day sight become so unique and precious to us? THROUH THE EVENTS of that week,I learned new things about the U.S. Coast Guard. No longer would I visualize them mainly as a friendly presence in Lake Erie's pleasure waters. They are, and always had been, so much more; they are a military force. After the attacks, a U.S. Coast Guardsman who had graduated from our local Riverside High School was ordered to the New York harbor to lead up post-attack operations at the waterfront. He was Commander Gary Smialek, son of our friends and well-known former local educators Elaine and Norbert Smialek of Painesville Township. Just a month before,the Smialek family had been standing happily on the sunny deck of a Coast Guard cutter at home port in New Bedford, Massachusetts, witnessing the formal Change of Command ceremony that placed the cutter Tahoma into Smialek's capable hands. "It was a proud and happy moment," his parents later told me. "Who could have known that, one month later, our son would be in such a troubled place, anchored just off shore from Ground Zero, between the Statue of Liberty and Lower Manhattan?" When the first attacks had struck the Twin Towers, U. S. Coast Guard forces were immediately mobilized. Coast Guard cutters were dispersed to major ports and waterways along the northeast seaboard and the Gulf of Mexico. For Commander Gary Smialek and his crew, the call came in as the Tahoma was arriving at Newport, Rhode Island after routine patrol. THE TAHOMA CHANGED course, arriving at New York after midnight. The famous, perpetually lit city skyline lay in unaccustomed darkness, and daybreak soon revealed a landscape drastically changed from what it had been. "The smell of smoke from the terrorists' destructive act was readily discernible from 20 miles away," Smialek told me. "The waters and the air were devoid of the normal commercial and recreational traffic; nothing but boats involved in rescue were allowed into the harbor." Smialek assumed charge of all Coast Guard ships and boats in operation there. Security aboard the Tahoma was extraordinary for a Coast Guard vessel. With threat at the second highest level, an around-the-clock sentry walked the flight deck with an M-16 rifle; spotters with binoculars manned the bridge wings at the bow; and the Coast Guard began monitoring "everything waterborne" and tracking all boats operating in the harbor. The mission was to assist local officials with crisis response and to assure safety and security of the port and waterways. Much of the response was coordinated within 24 hours. The Coast Guard coordinated evacuation of one million people from Lower Manhattan; assisted the lead emergency agencies with transport of medical and logistical personnel and supplies; and led the effort to secure the harbor. Within two weeks, with limited reopening of the harbor, Coast Guard security continued as "Operation Guarding Liberty." If the public had a common notion that Coast Guardsmen were people who helped people whose boats had run out of gas, the work at New York was dramatic proof that the Coast Guard serves a significantly larger role, defending our shores and sometimes serving in harm's way. THROUGH THE WEEK of 9-11, my column shared some important Coast Guard history with our readers. Sometimes called the fifth branch of the U.S. Armed Forces, this smallest of U.S. military forces is the nation's oldest sea-going service. Established in 1790, it is the only military force working on a daily basis, 24 hours a day, on such designated missions as search and rescue; military readiness; environmental protection; marine science; boating and port safety; merchant marine safety; aids to navigation and law enforcement. In war, it becomes a specialized segment of the U.S. Navy, with equal status and responsibility. Commanded by a four-star general, the Coast Guard stands ready at all times to do its part in protecting this country. In regular but little-publicized exercises, it joins in anti-submarine maneuvers and convoy practice. In times preceding 9-11, it was involved in enforcing the UN embargo against Iraq and had roles in Operations Desert Shield and Desert Storm. (After 9-11, the highly decorated Smialek was promoted to Captain, serving as Commanding Officer of U.S. Coast Guard Patrol Forces in Southwest Asia, and Commander of Task Force 55.6 in Bahrain). Yet now it's also true, that on every anniversary of the great catastrophes of 9-11, America broods and looks with worry at the memory. Perhaps those dates should stir less fear and serve, instead, as a reminder of how united we Americans were in the days and months that followed the attacks. WITHOUT CATASTROPHE, or even with it, could we ever be that way again? But if you ever lose your way, I'll rush right out and find you!" This must be the Weekend of the Readers! Yesterday a Facebook friend posted a "Ten Favorite Books" challenge that started a good conversation about reading and books. I was still thinking about that conversation this morning after I finished a few hours of lawn mowing. After putting the tractor away, I poured myself a hot cup of coffee and sat down in my library to rest. My eye fell on a book with a title I didn't recall: "Temple Stream." I pulled that book off the shelf and discovered I had probably bought it in 2005 (date of publication) and forgotten (or hadn't found the time) to read it. But why not? I could see this was the perfect book for me, a sort of journal written by a man who had moved to property with a stream, and that stream-fed property had become a core of life for him and his wife. What little I read convinced me---except for a more rugged and more northern location and the fact that my stream is a tributary and smaller than his river---that the man and his wife had a life in common with my husband and me. I set the book on a pedestal beside my chair; I would begin to read it in my evening leisure hours. But first I'd relax with my coffee and my Sunday Plain Dealer (Cleveland newspaper). And what did my eye fall upon? Michael K. McIntyre's "Tipoff" column with the headline: "Take a selfie for literacy--share a pic of yourself reading." A selfie of yourself reading? How would you possibly do that, when you're also holding a book you are trying to read? As it turned out, I was willing to try, for that challenge was issued in connection with International Literacy Day and its social media campaign. Around the world, tomorrow (Monday) the Cuyahoga County Public Library System is hoping readers throughout the region will join that international campaign by taking a selfie of themselves reading a book, a newspaper, a comic---anything!---and post it on one of the social media sites. That, combined with my discovery of a book I had actually forgotten to read, was a signal for me. I may not qualify as one of the many celebrities who have opted to take part, but I do love to read. And I'm more than willing to encourage that love in others. So here you are... several attempts at a difficult selfie of Rose reading a book she had forgotten about!